I've spent five springs of the last seven living off the grid in the New England woods. It's still cold there in May and early June; the spring and its flowers and fruits are slow to arrive. But part of the joy of being up there is seeing the season come in slowly-- on early hikes there are green buds, fiddleheads, rare appearances of spring ephemerals. Then the trillium comes in, jack in the pulpit, then ladyslipper, and by mid-June, the peepers have become frogs, the ferns have unfurled, and the beech trees have all leafed out. I've missed that, and living in a season that's unplugged from "technology," yet so clued in to the natural world, other people, text and the senses. But it's also been nice to experience spring a different way, elsewhere. In Kentucky a few weekends ago, I was amazed by how green everything was, and this past weekend in Durham, the smells of the honeysuckle and peonies were overwhelming. The seasonal foods of southern climes feel new again too-- I've gotten to enjoy ramp season and red buds and early glow strawberries-- and that's been a delight. On a rare weekend when I was home in D.C., Morgan came over for backyard cocktails and baked goods. Though not quite local yet, I'd received some Blenheim apricots in my farm box, and Morgan had a selection of spirits from Art in the Age. With both, we opted for simplicity-- to let the flavors of the fruits and herbal liquors shine. 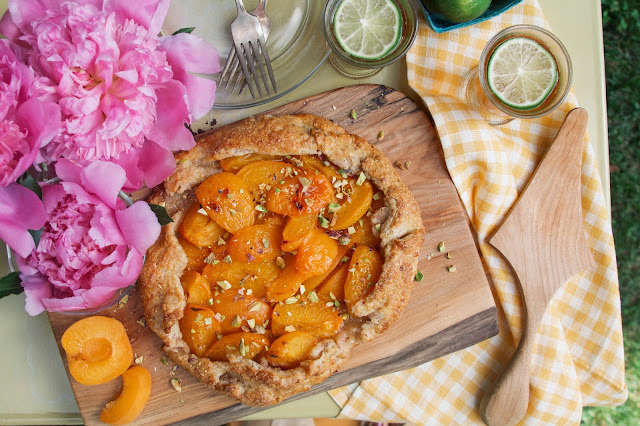 Galettes are perfect for this in the baked goods department, and this one has few ingredients and a basic crust with a touch of cornmeal, adding a little grit and whole grain that's complimented by the pistachio pieces sprinkled on top. 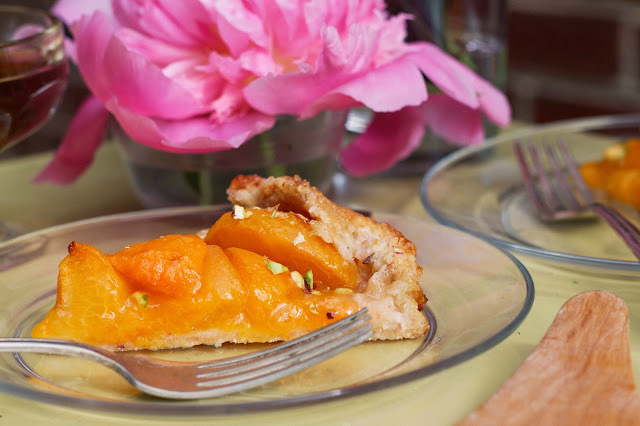 I kept the sugar to a minimum here-- the apricot filling still had a tartness to it, but feel free to adjust to your own taste. 4. While crust is filling, prepare filling: In a large mixing bowl, combine apricot quarters, sugar, bitters, and lemon juice. Remove one dough disc and leave other in fridge or freezer for another use. Roll out one crust disc on a piece of parchment and transfer rolled crust and parchment to a large baking sheet. 5. 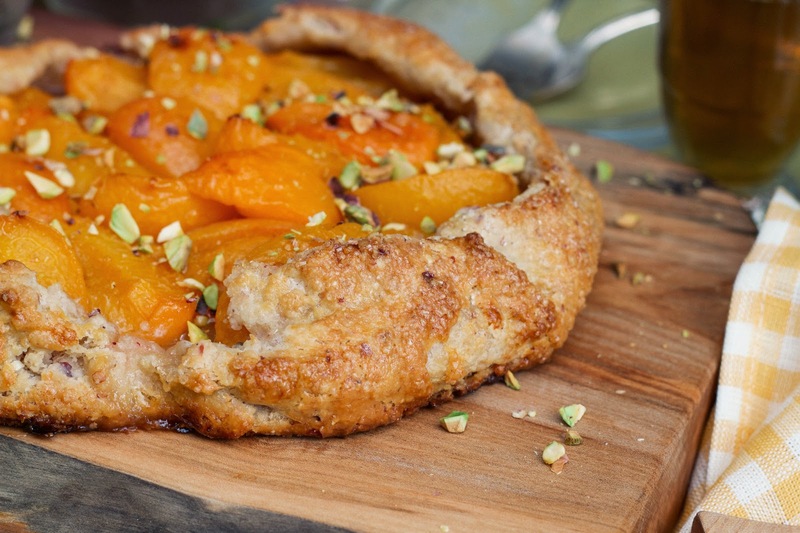 Preheat oven to 375 degrees F. Ladle apricot filling onto rolled crust, leaving a 1-inch border. 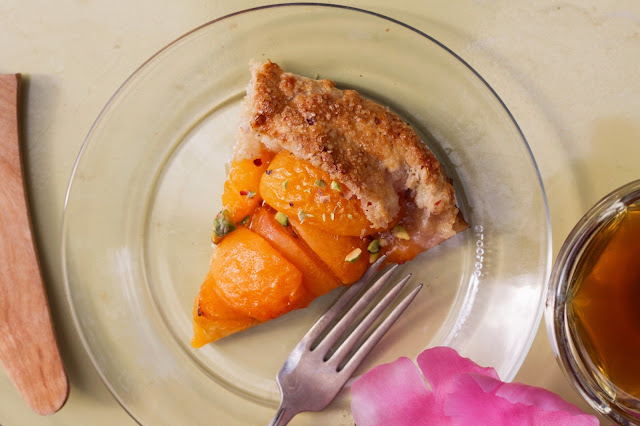 Sprinkle 1 Tablespoon of Turbinado sugar over the apricots, then fold up the pastry over the edges of the filling, leaving most of the apricots uncovered. 6. Place galette in freezer for 20-30 minutes while the oven preheats. Once chilled, remove galette from fridge and brush the pastry with the egg wash and sprinkle lightly with the remaining 1 Tablespoon of sugar. Bake tart in the middle rack of the oven for 30-40 minutes, until the fruit is bubbling and pastry is golden brown. 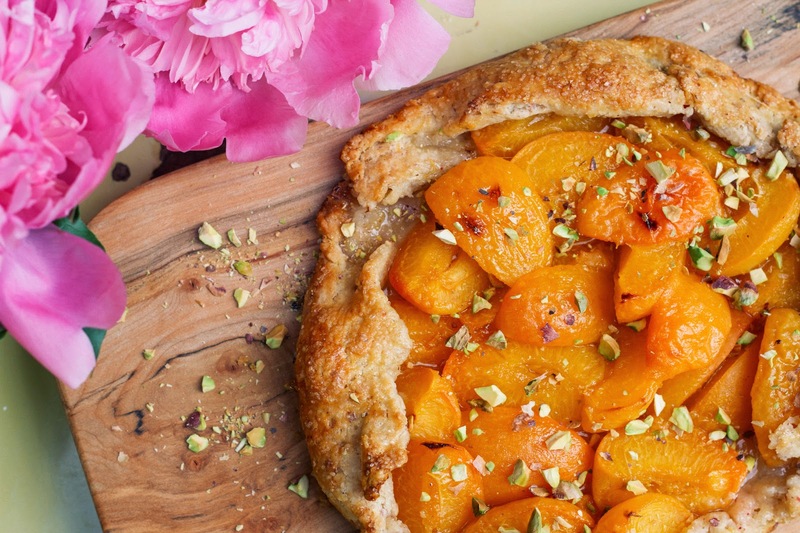 Let the tart cool completely, then sprinkle with pistachio crumbles, if desired. Serve just warm or at room temperature. For simple Art in the Age cocktail recipes, with Root and Snap + more photos, visit Panda Head Blog. Thank you to Whole Foods P Street for the flowers and ingredients. Wow, this sounds so good! I love the idea of adding extra crunch to the crust with cornmeal.